If you’re currently running Facebook or Google Adwords or if you’re even THINKING about running either, you need to read this. I’ve had several clients come to me after wasting thousands of dollars on Adwords or Facebook ads with online ad agencies. I keep seeing these agencies make the same mistakes over and over, at the expense of my clients so I wanted to write this as a warning. If you’re looking into working with an online ad agency make sure you ask the 3 questions below before signing a contract. If you’re already working with an agency and they’re not doing these 3 things, go back and ask them to. They’re necessary to set up to ensure your campaigns are actually profitable. Some of these agencies provide metrics that are misleading and can make you think the campaigns are more successful than they are…. A lot of clients have told me they’re scared to run online ads because of unsuccessful attempts in the past. The reality is, it’s not that hard to setup a profitable campaign. It’s simple planning and analytics. Depending on the price point of your core offer, they can take time to start generating a profit but you can definitely see a positive ROI within a month or two. At the end of the day if you know your prospect, the campaign is properly planned out and the WHOLE process is tracked (more on this below), then online ads can be a great way to increase leads. Question 1: How to do you track the success of an ad campaign? 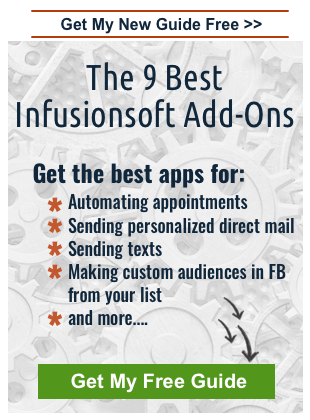 Recently, I suggested to one of my Infusionsoft clients that we should add his Facebook campaign data to his dashboard. Up until this point they weren’t tracking sales from Facebook ads, just the number of leads collected. After checking out his account I realized he had spent over $14,000, resulting in only 6 sales. Because of the high price point of his offer, he has made enough to cover the cost of the ad spend but just barely. Considering the amount that they were paying the agency to run the ads, they were losing thousands every month. The problem was that the agency was sending reports on number of leads. My client didn’t realize the ads weren’t profitable because they were driving a lot of traffic and generating thousands of leads. It was a mistake to assume that these leads converted to sales at the same rate as other lead sources. You need to set up complete end-to-end tracking on your ad spend if you don’t have that set up already. You cannot just track clicks or even leads because leads from these ads may not convert as well as other lead sources (your website, trade shows, inbound calls, etc.). Your ad agency should be providing reports on clicks, leads and sales. If you’re agency tells you that they are not responsible for sales then you’re working with the wrong agency! When I run Facebook or Google ads for my clients, I deliver a simple, easy to read, monthly report on campaign results. If that’s not something you’re getting already then start asking your ad agency for it. Question 2: What is the process you use to create ad campaigns? I have two other clients that have worked with the same large SEO and Adwords company. This company is becoming notorious for outsourcing the work to people who have no idea what they’re doing. **I won’t name any names but if you’re wondering if it’s your ad agency then give me a call. I’ll let you know over the phone. This company’s only promise is cheap clicks. They specifically told one of my clients “It’s not my job to get you leads”. This is after she spent $1000 on ads with them (note that this does not include their fee) and she didn’t get a single lead. They don’t think about online ads as part of a larger marketing funnel, they just use them to send you traffic, usually low quality traffic, and what you do with that traffic is your responsibility. The problem is that cheap clicks are easy because you can use curiosity or big promises to get someone to click through, only for that traffic to be disappointed in the next step of the sales funnel and bounce. This makes CTR (click through rate) a terrible metric of ad results. For the highest conversion rate, you need congruence between the ads and follow-up messages. You cannot treat the ad like a stand alone marketing piece. It’s one step in a bigger sales funnel and needs to be treated that way. Ads need to be created with a bigger marketing plan in place. Before the ads are created you should know exactly who the target audience is, what offer will be made to convert the prospect to a lead (opt-in, book an appointment, etc) and what offer will be made to convert the lead to a client. Only after those are clearly defined, should the ad be created. Whoever is creating your ads should recognize the importance of the complete marketing plan and should be asking questions to review your sales funnel before they create the ads. If they don’t then that should be a red flag. Similar to Lesson #1, they should also be emphasizing the conversion rate to a sale as success of a campaign, not an opt-in or lead. If they just want to setup the ads for you and send you traffic, this will almost definitely be a waste of your money. If you’re already doing complete end-to-end tracking of your ad campaign and it’s profitable then you can continue to let it run. If you’re not sure about sales data from these ads, I would suggest setting that up first. If the ads aren’t profitable and the ad agency didn’t consider your whole sales funnel before creating the ads, I would consider switching to another provider. If you’re looking for a help with building ads within a complete sales funnel, then send me an email. 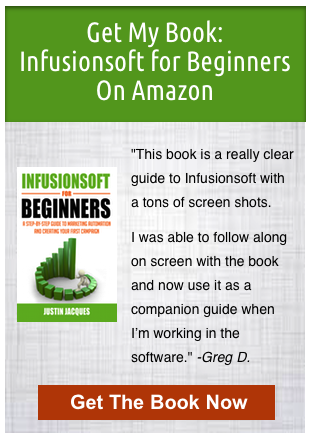 This is something my team and I do a great job with because we work together to ensure all parts work together, from ad to landing page to the sales follow-up in Infusionsoft. You can easily see the positive ROI each month on your IS dashboard. Question 3: How often are you monitoring and optimizing campaigns? Another client showed me their Adwords campaign one day when I was in their office helping them with Infusionsoft. Very quickly I noticed a problem costing them over $500/month. They were paying for hundreds of keywords that were unrelated to their service and weren’t making them any money. In this case, they did have about 10 profitable keywords but the rest were just burning money. Luckily they were still making money on the overall project. They were just wasting a lot too. Facebook and Adwords need to be regularly monitored for performance and optimization. Even with successful ads, ad burnout happens over time, where they just aren’t working anymore. Agencies should be providing regular monthly reports of ad campaigns so you can ensure there’s no wasted ad spend on ads or keywords that aren’t performing. And again, you should understand what these reports mean and how they relate to sales. Campaigns cannot just be setup and left to run. They need regular monitoring and optimization. However, ads should not be touched every day or even every week. They need to be run for at least a few weeks to collect statistically significant data. Once they’ve been running for about a month, you can turn off low performing ads or keywords and optimize the rest. For Facebook ads, this could mean changing the image, headline or body copy. For Adwords, this could mean changing the keywords, header or body text. For both ad types, you could also change the landing page, opt-in offer or follow-up process, which is also why it’s better to work with someone on the full sales funnel and not just the ads. When I run ads for my clients, we deliver a simple, easy to read, monthly report on campaign results. If that’s not something you’re getting already then start asking your ad agency for it. If you’d like help with ads and like the idea of complete transparency on your ad spend then send me an email at justin@justinjacques.com or click here to book a time to talk about your ads.